Chemicals labeled correctly: no missing or illegible labels. Proper storage: segregated by hazard class, compatible shelving and containers, away from heat sources, etc. See our chemical storage guidelines for more information. Reactives dated with date received and date opened, checked for condition and proper storage. Proper collection and storage of hazardous waste in closed, labeled and approved containers. 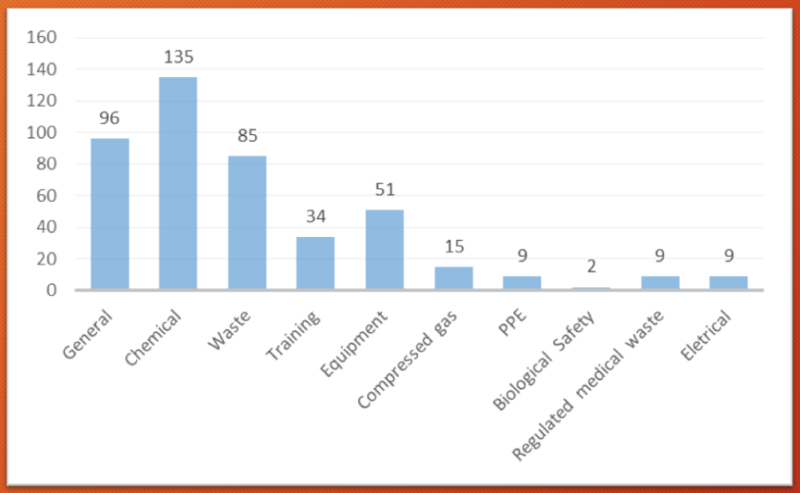 Chemical waste and storage issues were the most commonly flagged problems during our recent round of annual laboratory inspections. Other commonly-cited problems were missing or incomplete emergency information posters, objects placed in front of electrical panels and incorrect or missing hazard signage. Make sure your laboratory has all required information, labels and signage. Use the EHS Safety Supply Store to order new labels, waste containers and secondary containment. EHS held a peroxide amnesty day on Nov. 1. Over 120 undated or expired bottles were identified and removed for disposal. Moving forward, be sure to date all peroxide formers with date received and date opened. Researchers may test for peroxides upon expiration if the container is frequently used. If you find a peroxide-forming chemical of uncertain age or exhibiting any sign of peroxide formation (crystal formation, cloudiness, liquid stratification), DO NOT OPEN. Contact EHS immediately.